Crystals are extremely sorted after commodities across the globe and people find their lives searching for these rare objects. Renowned developers Playson are the face behind this wonderful game filled with colour and spontaneity. This game is slightly different to your standard slot machine as Playson has decided to take a step away from the usual 5 reel approach and adopt the cluster game method which has gained traction with games like The Legend of Shangri La and more. Don't waste more time and come play onlines slots now! Crystal Land adopts quite a different gameboard set-up than its Playson counterparts with their cluster game approach. The five reel format has been thrown out of the window and replaced by a much sleeker game face that mimics the type of game you may have experienced when playing Candy Crush or something of that ilk. Make sure to read details below to know why it's known to be among the top online slot games. 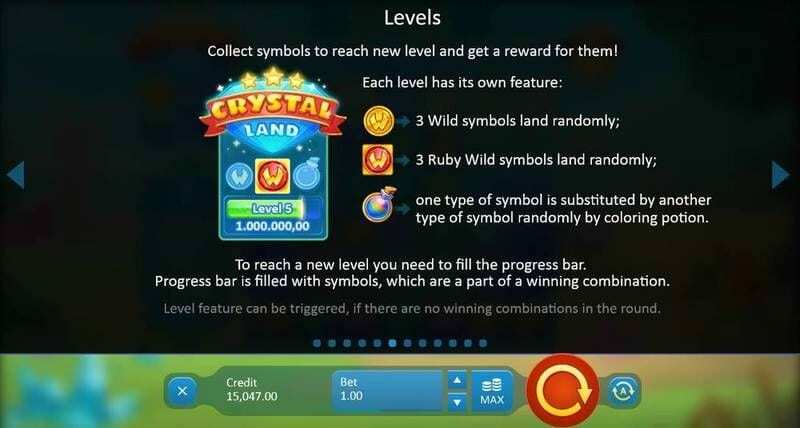 Along with this contemporary take on online slot gameplay the cluster reels allow for rows of crystals to be span free, revealing lucrative WILDS and bonuses that will be sure to keep your wallet bulging for many months to come. The 7x7 Crystal Grid is set in a serene land where the only meaning in life is found from crystals. When you begin to play this game you will immediately notice the beautiful scenery that inhabits the background of the game board. Witness the jaunty, little windmill and ripe fields, filled with crystals of all colours, shapes, and sizes. One of the great aspects of Crystal Land is the bonuses that can occur when you spin through the clusters. You will notice that a certain pyramid of the gameboard is blocked off and fixed. Find at least 5 of the same gemstone in a cluster either horizontally or vertically and you will win a prize. In addition, if you find the sort after white diamond then this can multiply your winnings by up to 10 times your initial stake. Unblock all rows on the gameboard and players will have the chance to access the main bonus game feature. This round will add three magical treasure chests to the board that can see you on your way to some great multipliers, as well as random icons and bombs that will help mine the diamonds and deliver those huge cash rewards. Come and check out our A-Z list of all our games on Wizard. 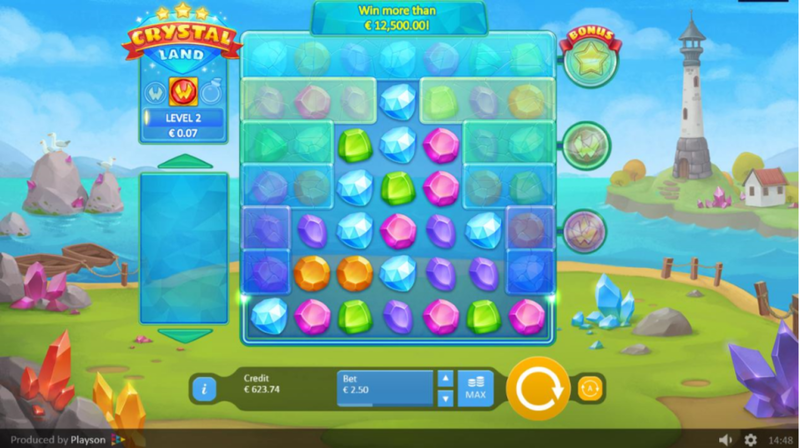 Crystal Land at its hard is a very simplistic game and Playson have done a great job at maintaining simplicity while also keeping gameplay exciting and offering a fresh and appealing aesthetic. There’s plenty of opportunity to win big and the cluster grids offer something a bit different to your average five-reeled slot game. If you enjoyed playing Crystal Land, Pumpkin Smash is another one for you!